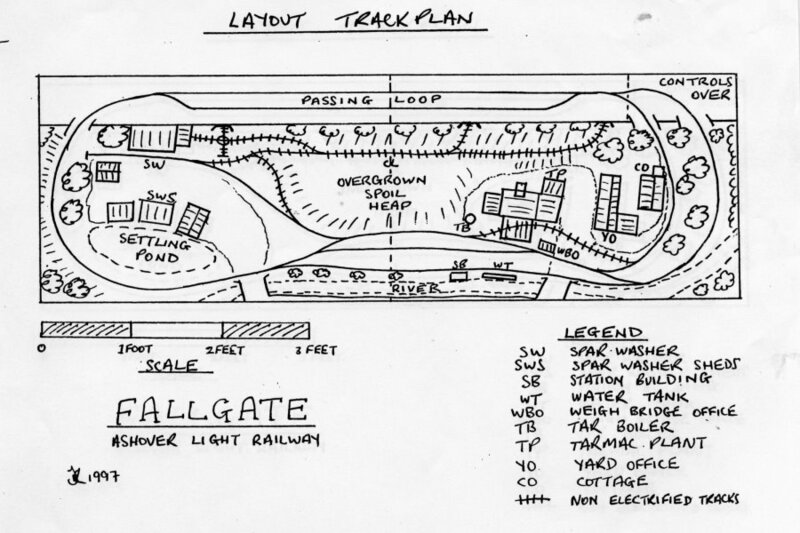 Fallgate is an 009 layout representing Fallgate station and yard on the Ashover Light Railway some time in the late 1930's. This means that it is constructed to a scale of 4mm/ft (1:76) which is the UK's 00 gauge, to a track gauge of 9mm, hence 009. This gauge scales to 2'3" but is used by modellers to represent narrow gauges from 60cm to 2'6"
Fallgate was created by Brian Love, a member of the 009 Society, and since 1998 it has been extensively exhibited throughout Southern and Eastern England. It is now owned by Stephen Little and Matthew Barrett and is based in Manchester. Since 2010 they have been taking Brian's excellent achievement to a new audience. Brian constructed the layout as an entirely self-contained unit (apart from the detachable back-grounds and lighting gallery). It folds in half into a protective box for transportation. The structures were scratch-built from plastic sheets and mouldings and the scenery has been constructed from a variety of proprietary and natural materials. Brian also conducted considerable research into the location visiting the surviving remains of the railway and drawing on the two key historical studies of the line published in 1955 and 1989. On the layout the main line arrives from Clay Cross through a cutting alongside the fluorspar washer, and after passing the station, disappears into another cutting towards Ashover Butts. At the time selected the tarmacadam plant has been constructed and passenger services were still in operation. The working pattern includes passenger trains to and from Ashover, crossing full limestone trains towards Clay Cross and returning empties. The empties usually take on water at Fallgate. A spur off the main line curves round past the yard offices and cottage and is the main access to Milltown Quarry. This was mostly horse-worked. In the foreground the River Amber meanders past the station with its water tank and in the background is Stars Wood where the fluorspar mines above the quarry were worked. These mines were mostly hand worked with the fluorspar brought to the spar washer in small wagons by a crew of two men. The large mound on the centre of the yard is the result of years of tipping from the washer and became overgrown in time. The Ashover Light Railway was a two foot gauge line of some seven miles in length, running from Clay Cross to Ashover in Derbyshire. It was built by the Clay Cross Company in the early 1920's for the purposes of transporting minerals (mainly limestone for ballast and road-making) from the quarries owned by the company along its route. Engineered by Lieutenant H.F. Stephens, the railway was constructed entirely from secondhand materials purchased from the War Disposals Board set up after the cessation of the 1914-1918 conflict. Practically all the rolling stock and the initial motive power, in the form of five Baldwin 4-6-0 locomotives, also came from that source. The only new items purchased were four passenger carriages built by the Gloucester Wagon and Carriage Company. The mineral carrying stock of the ALR consisted mainly of ex-W.D. type D drop-side wagons. A few type E centre drop-side wagons were also put into service but proved unpopular as they were more difficult to unload. The Ashover Light Railway opened officially on the 6th of April, 1925 and although passenger services were initially well-used, it was eventually reduced to a summer-only timetable, finally succumbing to the increasing competition from bus services, with regular services ending in 1936. The mineral traffic, the principal reason for the line, continued until 1950 when it became uneconomic due to increasing costs and unreliability. The end came when the standing order for ballast was cancelled by the Railway Executive of the British Transport Commission and the reason for the railway's existence disappeared. The railway finally closed to all traffic on 31st March 1950, two days short of its 25th anniversary, with practically all of its locomotives rolling stock and quarry machinery either worn out or already scrapped. The layout represents Fallgate station and yard on the Ashover Light Railway some time in the late 1930's with the tarmacadam plant, completed in 1936, opposite the station and the fluorspar washing plant towards Clay Cross, from which direction the line emerges from a cutting, passes though the station and disappears towards Ashover. Brian Love "Fallgate Ashover Light Railway in 009 Part One - layout considerations, construction, tracklaying and scenery" Railway Modeller September 2000, Vol 51 No.599 pp.433-438. Brian Love "Fallgate Ashover Light Railway in 009 Part Two - structures, locomotives and rolling stock" Railway Modeller October 2000, Vol 51 No.600 pp.504-5068. The ALRS plans to re-open a section of the railway. The Society website at www.alrs.org.uk features a photographic tour of the picturesque 2 1/2-mile route of the proposed new railway plus news from the Society. The 009 Society caters for all aspects of small scale narrow gauge railway modelling, both for the beginner and the experienced modeller alike, for the scratch-builder. the kit builder and the modeller who prefers proprietary ready to run equipment. The Society has a number of local groups, both in the UK and overseas, where members meet to discuss modelling matters, show their models and enjoy a social gathering with like-minded modellers. 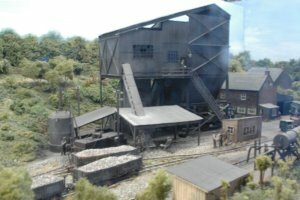 Some groups have exhibition layouts which are shown regularly at the various model railway exhibitions around the country.